Standing on a newly formed hillside of rubble in the destroyed Jabaliya refugee camp, five young men all claim to be resistance fighters. “All of Gaza are mujahideen,” they said. But when asked which of them had actually fired a gun in the three week-long battle with Israel, none gave a convincing answer. And as armed Hamas policemen return to Gaza’s street-corners and traffic-lights, many in Gaza are wondering where they were when it came to fighting the Israeli Army. Hamas still has enough power and influence here that few will criticise the Islamist movement openly. But when Hamas called for a rally to celebrate what it has been calling a historic victory over the Israelis, the citizens of Gaza voted with their feet – they stayed at home. In the past Hamas could easily call tens of thousands into the streets, but this time only party stalwarts could look around the devastation and believe this could be victory. “I think the resistance is strong,” said Beithar Ajar, 26, who described himself as a Hamas legal adviser. A truck with loudspeakers made a turn around Palestine Square in central Gaza city, playing Hamas battle songs. A barker standing on the back shouted insults to Israel’s government on a microphone. But relatively few green flags unfurled in the crowd. Hours after an Israeli unilateral cease-fire had begun in Gaza, militants fired four rockets into southern Israel and exchanged gunfire with Israeli troops. Hamas operatives in the Beit Lahiya area shot at soldiers, who returned fire. An IAF helicopter then shot the gunmen, the IDF reported. Qassam rockets were fired into Sderot at 9 a.m. — seven hours after Israel’s cease-fire went into effect. The rockets did not injure anyone, and Israeli aircrafts destroyed the rocket launcher soon afterward, an Israeli military spokesman said. The gunfire exchange in northern Gaza occurred after Palestinian gunmen opened fire on Israeli forces, the Israeli military said. Troops returned fire. Saturday night, Israel announced a unilateral cease fire which began at midnight GMT. Sunday has been largely quiet. But how long will the quiet last? That seems up to Hamas. 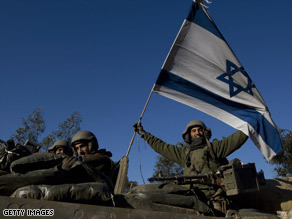 An Israeli soldier holds up an Israeli flag after leaving Gaza on Sunday. Israel stopped its offensive before reaching a long-term solution to the problem of arms smuggling into Gaza, one of the war’s declared aims. And Israel’s insistence on keeping soldiers in Gaza raised the prospect of a stalemate with the territory’s Hamas rulers, who have said they would not respect any truce until Israel pulls out. The cease-fire went into effect just days ahead of President-elect Barack Obama’s inauguration Tuesday. Outgoing Secretary of State Condoleezza Rice said the Bush administration welcomed Israel’s decision and a summit set for later Sunday in Egypt is meant to give international backing to the truce. Leaders of Germany, France, Spain, Britain, Italy, Turkey and the Czech Republic — which holds the rotating European Union presidency — are expected to attend along with Palestinian President Mahmoud Abbas, Egyptian President Hosni Mubarak and U.N. chief Ban Ki-moon. Netanyahu made the appeal during a Fox News Channel interview with Neil Cavuto on Wednesday. Netanyahu, a former Prime Minister and future Prime Minster hopeful in Israel, puts Mr. Obama in a tight spot. Netanyahu wants the elimination of Hamas: considering the group equal to if not the same as other terror groups like Hezbollah and al-Qaeda. Hezbollah and Hamas are both supported by Iran. Obama and Secretary of State designate Hillary Clinton are urging a new diplomacy with Iran. Netanyahu rejects this notion as unworkable. Frustrated at the escalating violence in the Gaza Strip, UN secretary-general Ban Ki-moon will travel to the Middle East to press for Israel and Hamas to immediately stop fighting and allow humanitarian aid into the Palestinian territory. Mr Ban said he plans to step up diplomatic efforts to get both sides to adhere to a UN cease-fire resolution calling for an end to Israel’s air and ground offensive in Gaza and Hamas’ rocketing of southern Israel. Since Israel launched its offensive on Dec. 27, Mr Ban said he has been on the phone constantly with top officials in the Middle East, Europe and the United States promoting a cease-fire. But he said phone calls aren’t a substitute for direct talks with leaders who have influence on the parties. The secretary-general leaves New York on Tuesday and will meet senior officials in Egypt and Jordan Wednesday, then head to Israel, the Palestinian-controlled West Bank, Turkey, Lebanon, Syria and Kuwait where he said an Arab League summit may add an extra session to tackle the Gaza conflict. His itinerary does not include a stop in Gaza because of the ongoing conflict. Heavy shelling was reported in Rafah on Wednesday night as the IDF stepped up its operations against weapons smuggling tunnels along the Philadelphi Corridor. The army had earlier dropped flyers on Rafah urging residents of the town living near the corridor to vacate the area. “Because Hamas uses your houses to hide and smuggle military weapons, the IDF will attack the area, between the Egyptian border until the beach road,” the flyer said, according a local UN official. After the flyers were dropped, about 5,000 people fled to two UN schools turned into temporary shlter, the official said. You are currently browsing the archives for the Israelis category.